Your own personal flight instructor! Voice command pack – talk to your instructor! Fly anywhere in the world with your instructor - there is no requirement to file flight plans! Detailed logbook – your logbook will show details of your flights, including landing speed, distance from the runway threshold and approach accuracy. It even lists the airfields you have visited! Your instructor is aware of, and will comment on, ground and air traffic! Once again, we have made several incremental improvements to FS Flying School, including new areas requiring the pilot's attention. Most large aircraft use flaps for takeoff and even if Mr Smith is not directly familiar with the airplane, you'll get a reminder to check its procedures if flaps are not set at takeoff. The autopilot is a very useful tool, but you don't need it for taxiing or at takeoff and Mr Smith knows this. Ready for takeoff? ATC is expecting you to get going and so is Mr Smith. Don't just sit there on the runway. Experience a new, rich level of attention to the details of the Boeing 757 and the way it should be flown by you. Get ready to deal with spoilers, autobrake, fuel switches, mode control panel, weight management, autothrottle, speedbrake, thrust reversers, yaw damper, anti-ice and much more. Works with several Boeing 757s including the excellent Boeing 757 'Freemium' from Just Flight and the splendid Boeing 757 from Quality Wings! Works with several DC3s including the Microsoft DC3 and the marvelous DC3 from Just Flight! There is lots of detail in your instructor's treatment of flights in the exciting Learjet 45. Stall speeds, use of yaw damper, thrust levers, flap speeds, before takeoff procedures, fuel management, starting the engines, pitot heat, anti-ice, APU, starters, fuel pumps, engine fires, spoilers, FGC controls, landing techniques and much more. 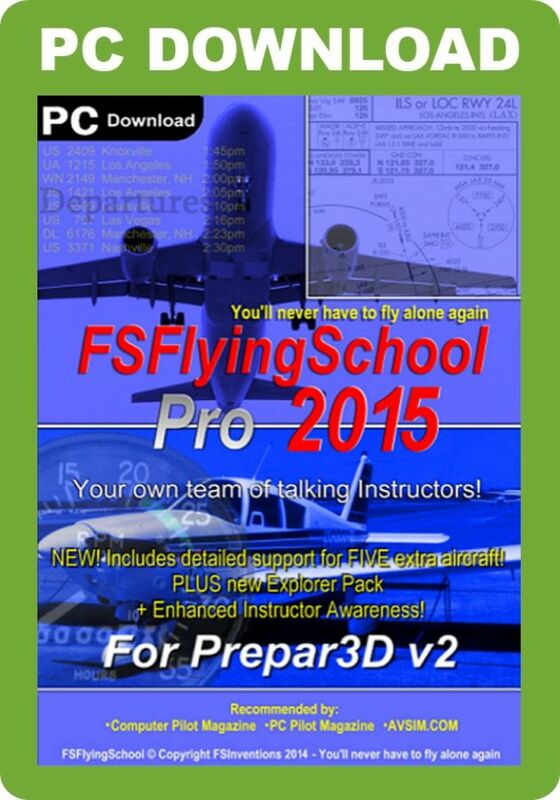 Lots of hints and insider tips on how to get the most from FS Flying School are now included. Even seasoned FS Flying School pilots can find something new! It's a small thing - but so convenient. 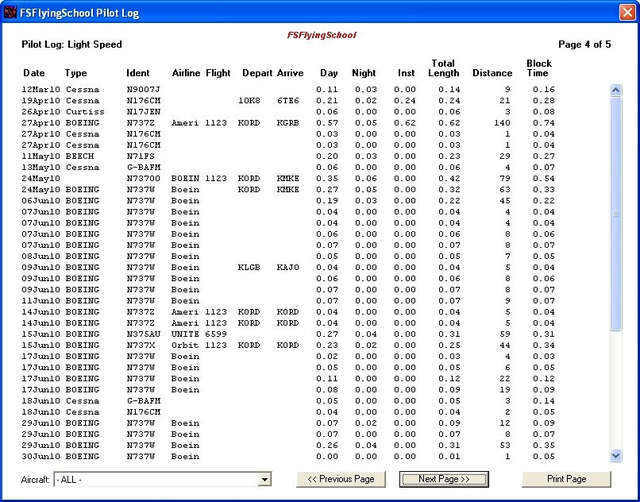 When your flight is over, FS Flying School's Log Book Screen is automatically displayed, so you can see at a glance how you performed. This exciting new pack contains a set of features that will have you exploring the world in your simulator! Turn this on at the Pilots Screen of FS Flying School and let your instructors automatically tell you full details on your nearest airport as you fly over or merely in the vicinity of each one. Reports nearest airport with its ICAO code (e.g. Kilo Lima Alpha X-Ray), bearing, distance, runway length. This works for airports within approximately 35 nautical miles of the airplane. Say this command to let your instructor know that you are about to request information on an airport. Your instructor will confirm he/she is waiting with the response "Airport..."
Say the 4 letter airport ICAO code using the phonetic alphabet (e.g. Kilo Lima Alpha X-Ray). If you have announced the code of a valid airport, your instructor will confirm this by replying with its ICAO code, bearing, distance, runway length. This works for airports anywhere in the world. ICAO codes must contain only letters. Very useful when used with the Explorer Pack's "Divert to Alternate" command when you want to fly to a specific airport and don't want to return to the FSX flight planner or the FS Flying School flight plan screen. And also for just getting general information! Now you can TELL your instructor where you want to go! Simply say this command and your instructor will know that you have changed the FS Flying School flight plan to fly to the last airport you requested information on. This works with any airport the instructor has described to you as a result of any of these commands: "Nearest Airport? "; "Airport [x] o'clock? 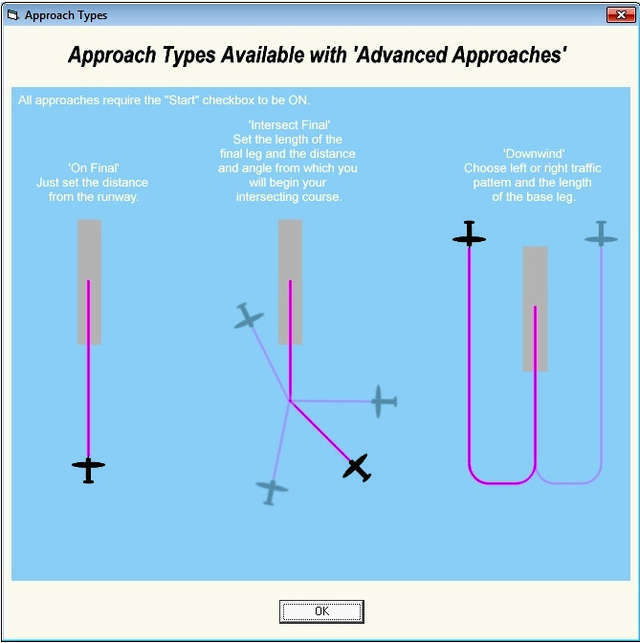 "; "Specify Airport"
The instructor will respond with its ICAO code, bearing, distance, runway length. Simply say this command and your instructor will know that you have changed the FS Flying School flight plan to land at the next (numerically listed) runway at the airport in the flight plan. You can say this several times if you wish in order to find the runway you want. 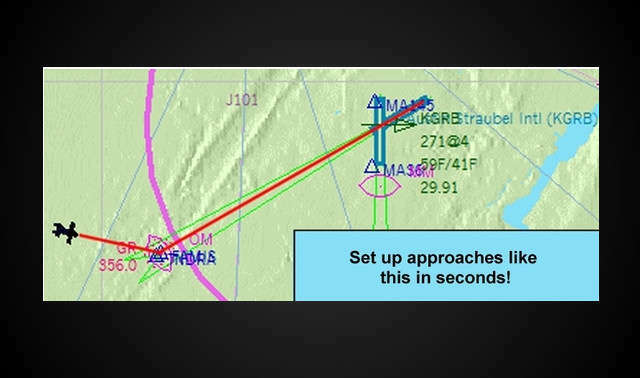 The instructor will respond with details on the newly chosen destination runway. 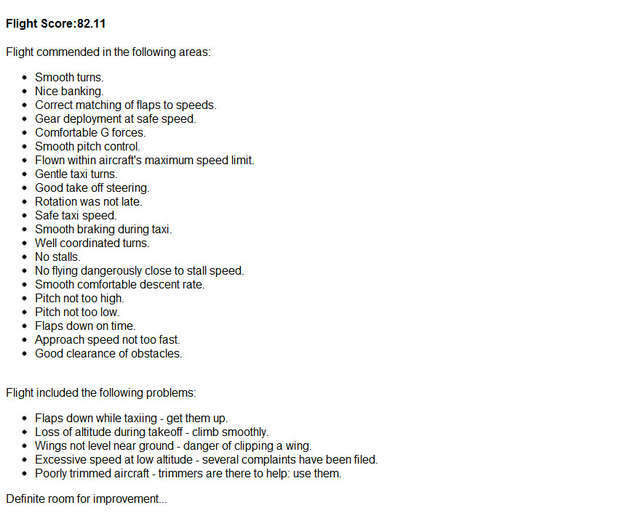 Very useful for changing to a better suited runway, especially if just directed to it by ATC. We all know we need to practice, practice, practice, our approaches and landings. Folks around the world are busy flying with the On Approach features of FS Flying School. Introduced in 2011, these features make setting up approaches to any runway in the world the work of only a few seconds. FS Flying School PRO 2015 includes the Advanced Approaches Pack which allows the pilot to set up increasingly complex approaches. Set up an approach which intersects your final approach from any angle you choose. This was previously limited to 45 degrees. You can begin your approach at the start of the 'Downwind' leg of the traffic pattern at any runway. Fly left or right traffic - the choice is yours! Optionally set the specific altitude of your approach using MSL or now AAL (Above Airfield Level) - very useful for quickly setting 'pattern altitude'. You can specify that only the slick 'detailed' airports supplied with FSX Deluxe or FSX Acceleration will be included in random selection. 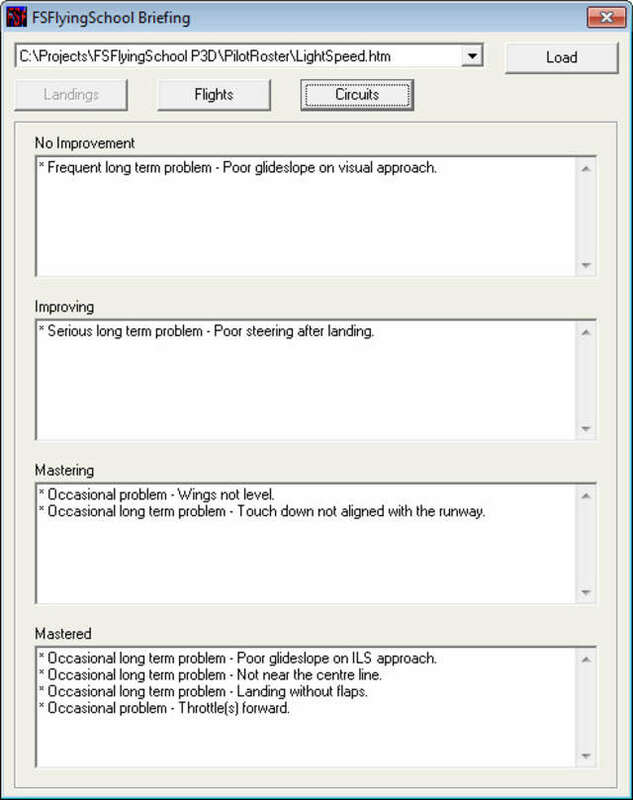 The Flight Plan screen includes a handy detailed diagram showing which approach types are available to set up with FS Flying School PRO 2015 at your selected runway. For those who like variety and challenges, the wind can now be set to a random strength and direction. This will keep you on your toes and is a great way to fly a whole host of very different approaches in minutes. Low visibility is always a challenge - now you can set it to a random distance that will automatically vary with each new approach! Who knows what you will be facing next time? Instructor, Mr Smith, will be watching closely when you are navigating using VOR navigation aids. He will let you know the meaning of the different indications and instruments of your aircraft's VOR Indicator, such as the TO/FROM/OFF flag, the Omni Bearing Selector (OBS), and the Course Deviation Indicator (CDI). 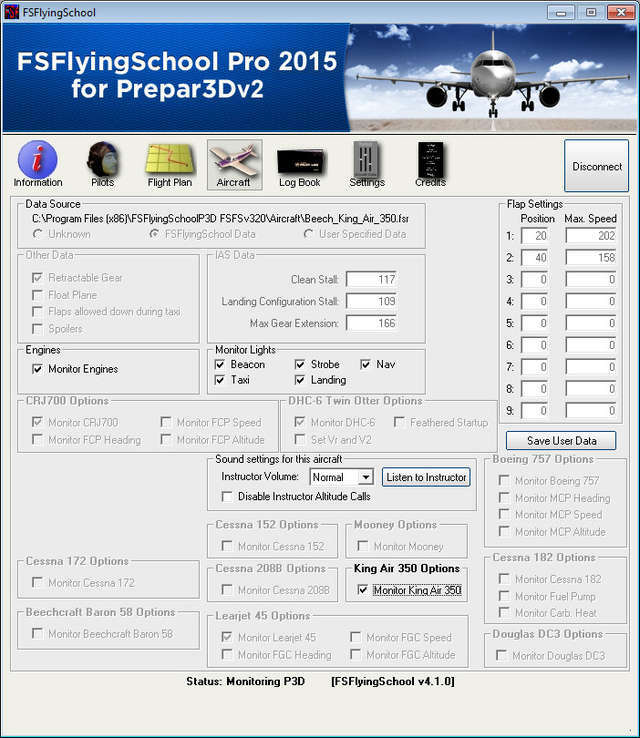 This 'Detail Pack' for FS Flying School Pro 2015 offers extra detailed treatment when flying this marvellous airplane. In addition to FS Flying School Pro 2015's detailed analysis of your flights, you'll hear extra advice and warnings all specific to the c208B. 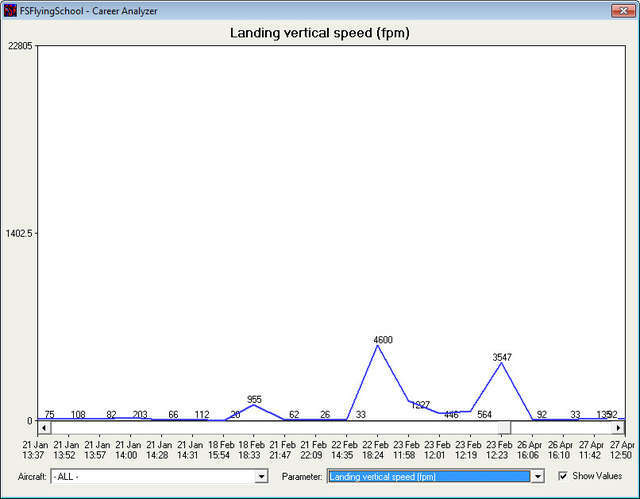 Stall speeds, use of propeller control, rate of climb, angle of climb, flap speeds, fuel, starting the engine, landing techniques, fuel condition lever and much more. Get ready to fly the c208B like you've never done before! 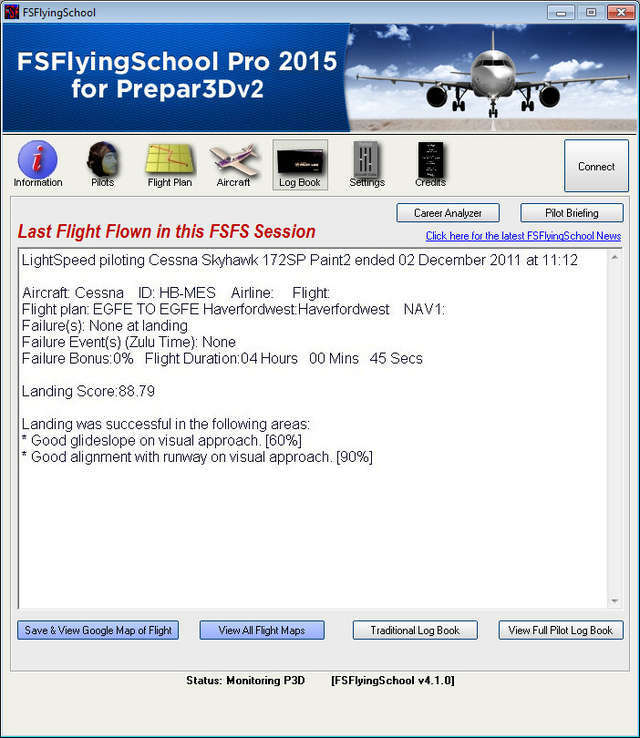 FS Flying School Pro 2015 offers an especially detailed experience when flying this fast, fun aircraft. Your instructor will be reading C182 checklists to you, watching your performance and looking for your attention to C182 details. Review your flight paths over real-world satellite terrain using Google Maps, store them and look back over them at your leisure. You can even share them with friends and track taxi routes too. FS Flying School Pro offers extra detailed treatment when flying the ever popular C172. Your instructors know the finer points of this machine and will expect the same from you! This 'Detail Pack' offers extra detailed treatment when flying the marvellous Beechcraft Baron 58. The instructor will be reading the Baron 58 checklists to you, but what's more important is that he'll also be watching your performance and looking for those details that are so essential in this aircraft. In addition to FS Flying School Pro 2015's detailed analysis of your flights, you'll hear extra advice and warnings all specific to the Baron 58. Stall speeds, use of fuel boost pumps, cowl flaps, propeller controls, rate of climb, angle of climb, flap speeds, run up procedures, fuel, starting the engines, one-engine-out speeds, landing techniques, mixture controls and much more. Get ready to fly the Beechcraft Baron 58 like you've never done before! FS Flying School Pro 2015 offers an especially detailed experience when flying this fast, fun aircraft. 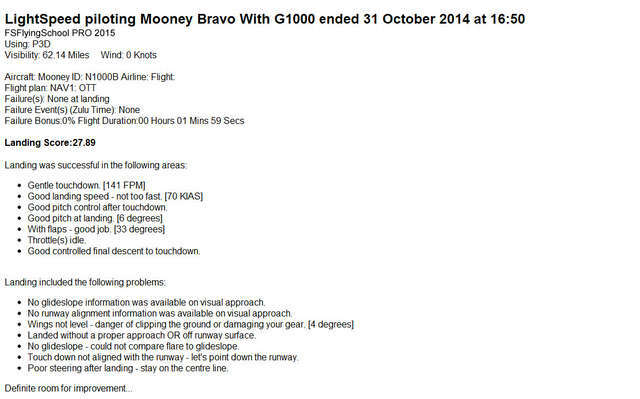 Your instructor will be reading Mooney Bravo checklists to you, watching your performance and looking for your attention to Mooney details. Extra advice and warnings all specific to the Mooney Bravo include flap speeds, run up procedures, fuel, starting the engine, stall speeds, use of fuel boost pump, cowl flaps, propeller control, rate of climb, angle of climb, landing techniques, mixture control and more. Fly the Mooney Bravo like the Pro's! This 'Detail Pack' for FS Flying School Pro 2015 will have you flying the C152 with skill and with the respect it deserves. Your team of instructors have detailed knowledge they are ready to pass on to you and will read checklists at your command. You'll get all the usual FS Flying School detailed analysis of your flights, as well as Cessna 152 precise information on stall speeds, rate of climb, angle of climb, flap speeds, run up procedures, fuel, starting the engine, landing techniques, carburettor heat, mixture control, use of engine primer and a lot more. The Cessna 152 is hugely popular - find out why! This demo allows you to use the full functionality of the application in the vicinity of KGRB (Green Bay International Airport). There is no time restriction. Get training, advice and analysis of your flying skills anywhere in the world in the updated 2015 edition of this popular utility which now has more new features and more Detail Packs for popular aircraft! 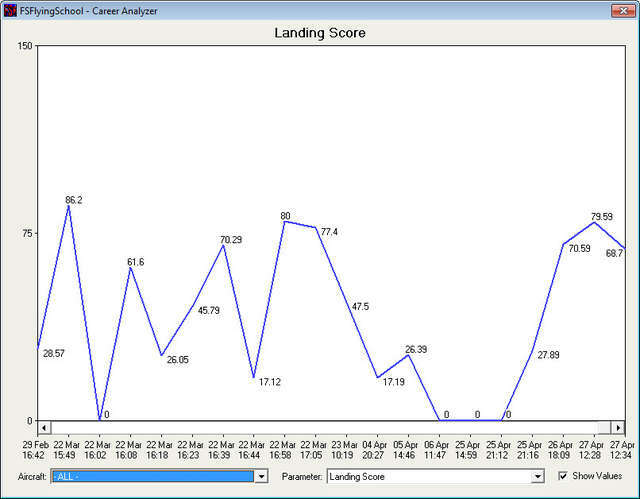 This unique program includes a scoring system to rate your flight, verbal tips, a logbook showing flight details, graphs analysing over 70 areas of airmanship, assistance from the Flight Instructor and more besides!